The Specialized Epic Ultimate was an attempt to build the best bike, regardless of cost. The titanium lugs were made by Merlin Metal Works and the carbon tubes were glued into place at Specialized. 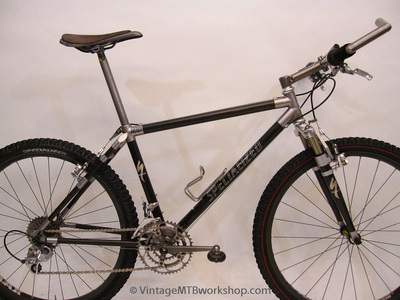 While Specialized never made any money directly off these bikes, they were a great marketing tool to lure people into buying their production models. This Epic is one of two that Mike Sinyard personally signed off on as receiving custom geometry, which meant a special set of fixtures at Merlin were built to weld the lugs. 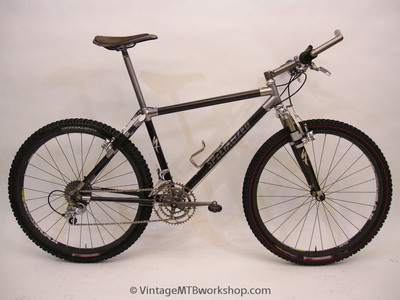 it is no surprise that the other custom bike was made for Ned Overend. This bike is a 16" size with the toptube of an 18" frame. 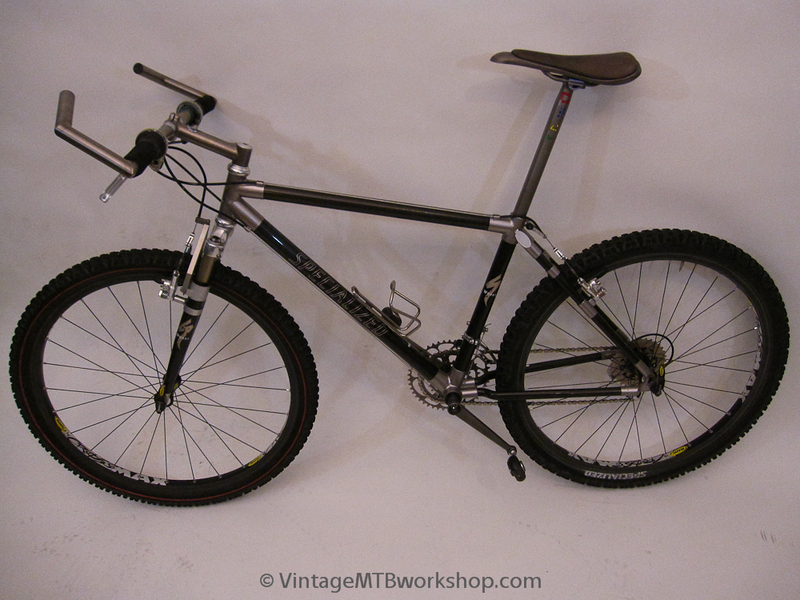 This bike was built for the head of S-Works, and was ridden and raced extensively. It was used as a test sled for potential parts being evaluated for the S-Works program, and it features a number of prototypes and one-offs that were received as gifts to the owner. The ride can be described as soft, a noodle, a swingset. There is 1/2" of backward flex in the saddle and seatpost. 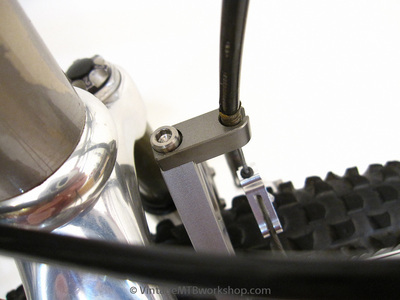 The cranks bend by 3/4" to lateral loads. 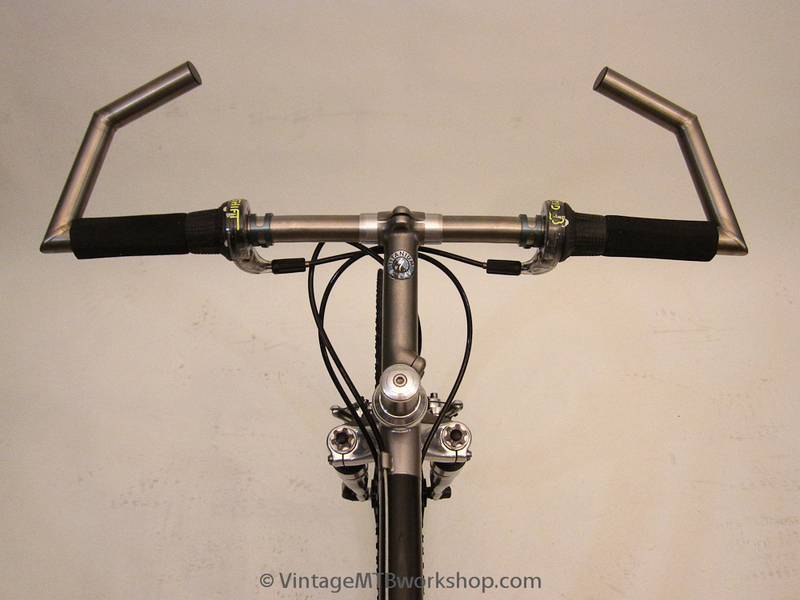 The tips of the handlebars will twist a couple of inches up. It's a unique ride and a lot of fun as the bike floats over the terrain. Currently built to a touch over 18 pounds, this was once close to 17 pounds, and may return to that with time. Almost every bolt on the bike is titanium. 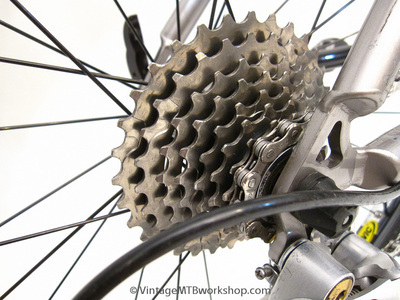 A detailed explanation of the exotic parts on the bike is described at the bottom of the page. 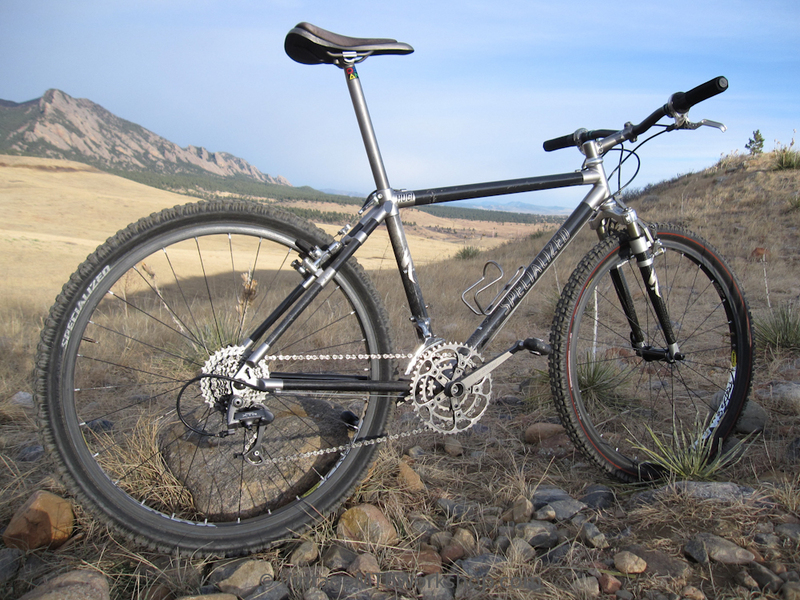 Frame: S-Works Epic Ultimate with custom geometry: 16" seattube frame size with the toptube of an 18" frame. 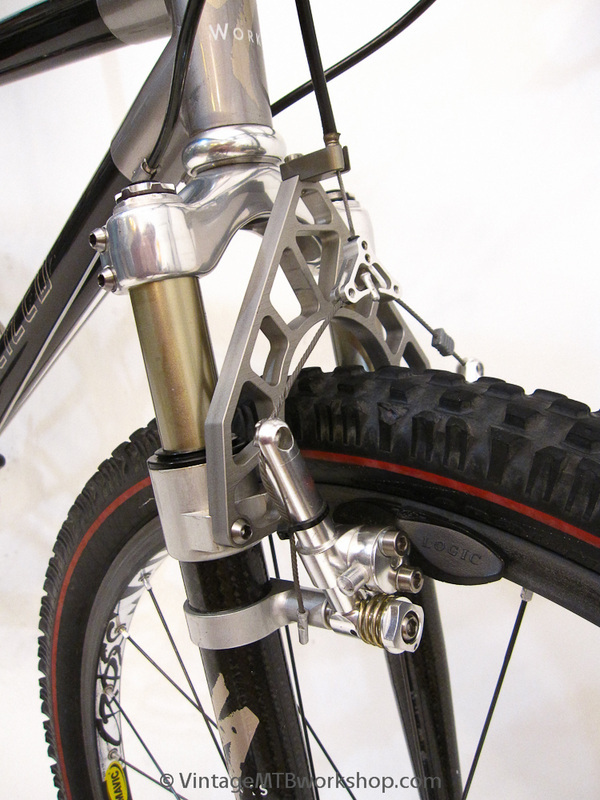 Fork: Specialized FSX with custom internals made by Mark Winter of Rock Shox. 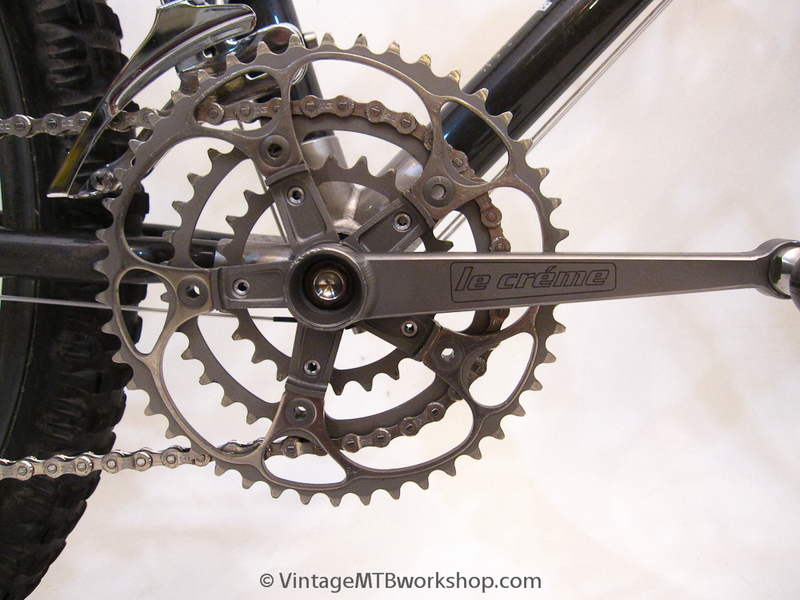 It has a special rebuild kit from Mark. 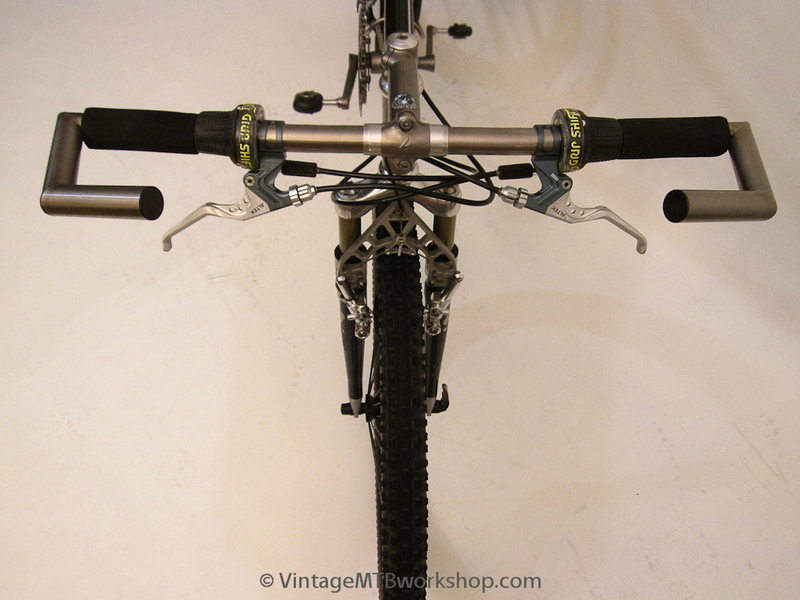 The steerer is titanium off a Paris-Roubaix fork. 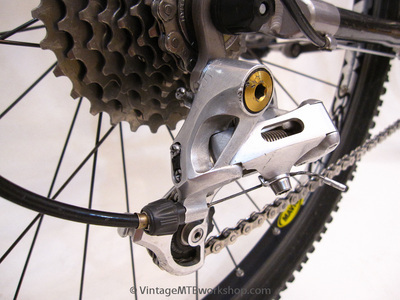 The brake arch was custom made by Wayne Lumpkin of Avid as a gift to the owner for using Tri-Align brakes on S-Works bikes, which was a big break for Avid. The hardware is all Ti. 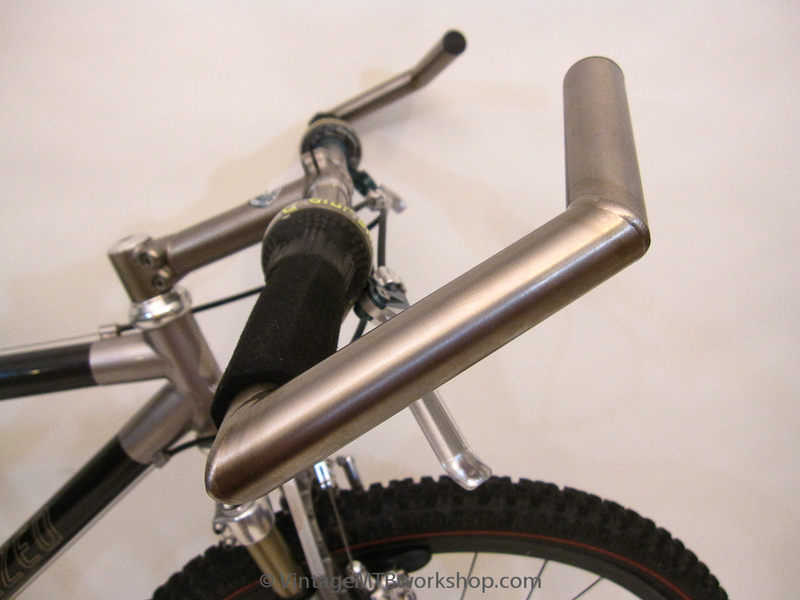 Handlebar and barends: Two-piece welded Ti, with a joint inside the stem. This was another gift from Wayne Lumpkin. Stem: The owner of the bike made the mold for these cast 6/4 titanium stems, which were made in Connecticut. 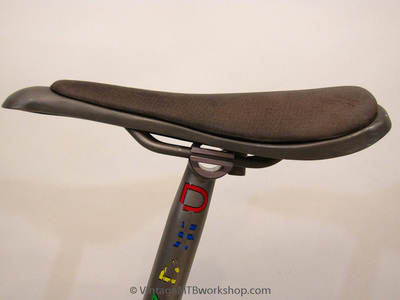 Shifters: Grip Shift race issue. 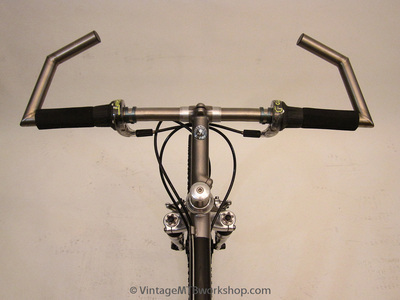 At one time the bike ran a set of prototype Grip Shift shifters that were later returned to SRAM. Brake Levers: Altek. At one time a set of prototype magnesium S-Works levers were used, and may be added to the bike at some point. Rear Derailleur: This prototype Shimano derailleur was recently added to the bike, but a similar prototype was used previously. Cogset: Tioga titanium. 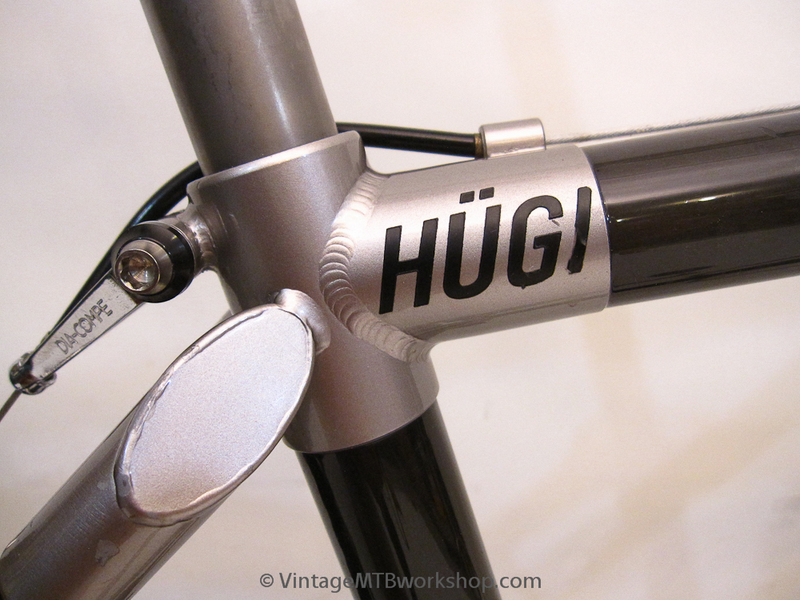 The previous cogset was a Hugi alloy, given to the owner along with hubs by Mr. Hugi. 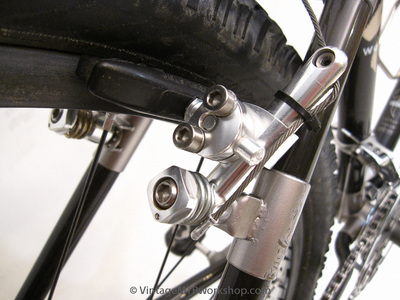 Brakes: Avid Tri-Align with Ti hardware. 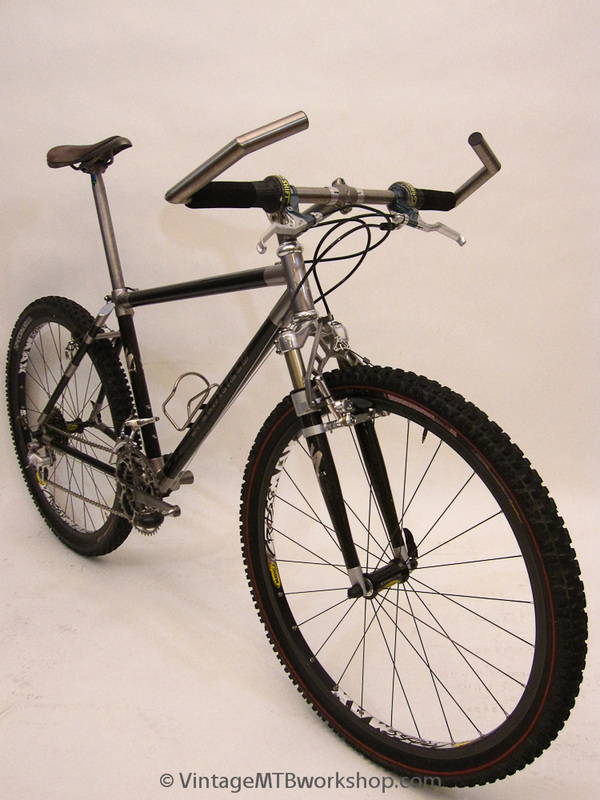 At one time this had Avid prototypes which are now incomplete. Crankset: La Creme prototypes. Arms are serial #1 an #2. 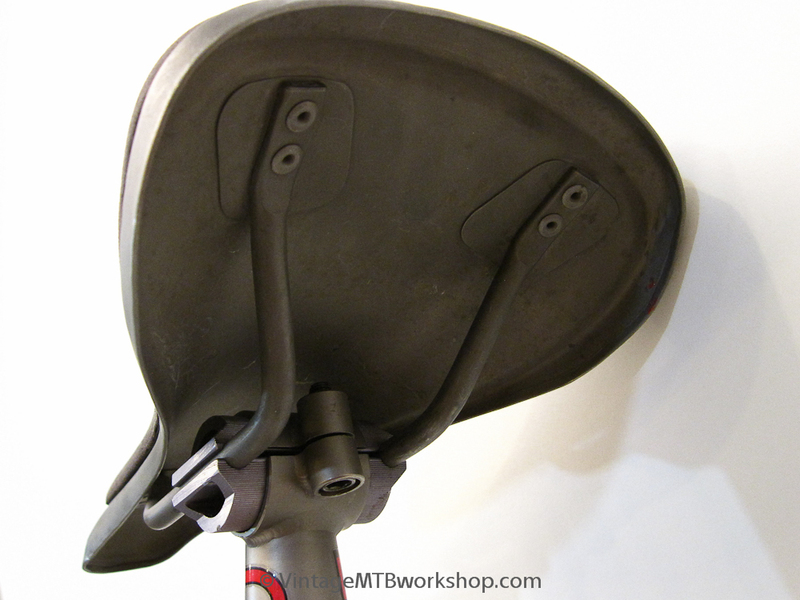 Some of the lightest made at 297 grams with hollow arms. Most broke, however these were X-rayed and determined to be sound. 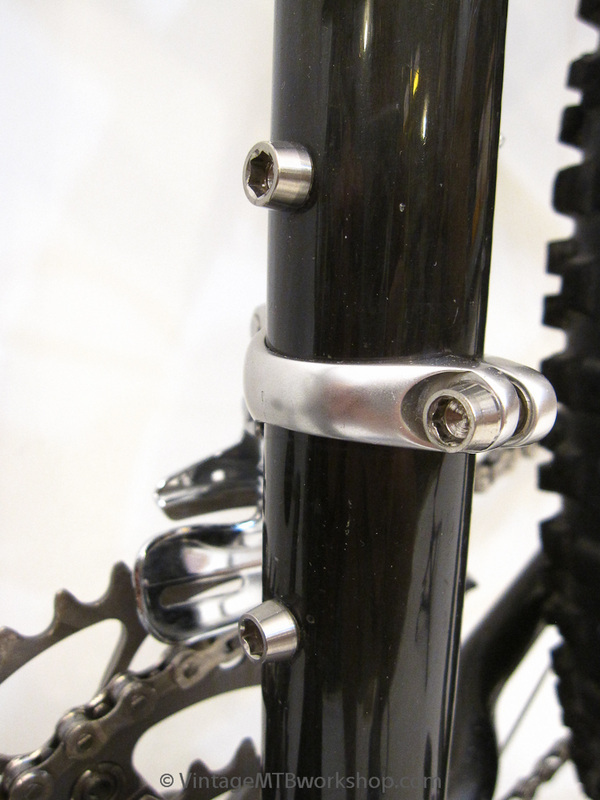 The Rings are Boone and the hardware is SRP titanium. 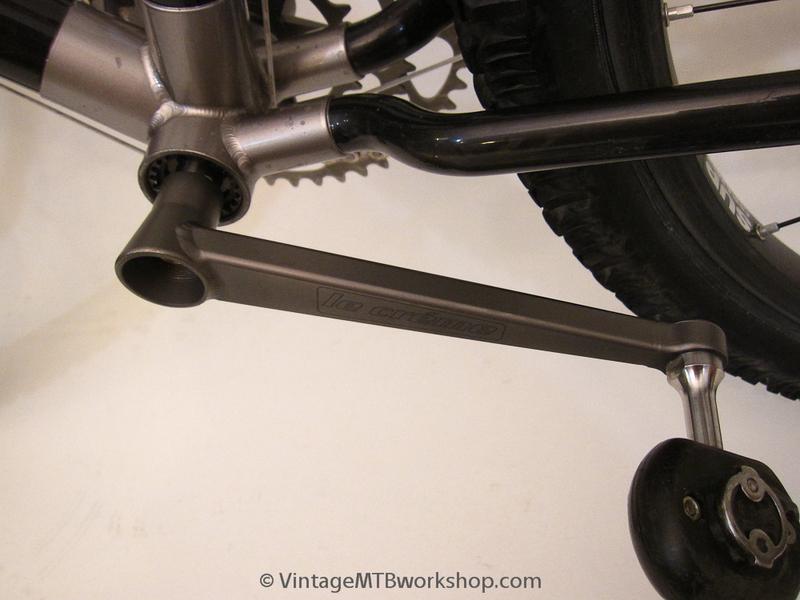 Bottom Bracket: S-Works Ti. 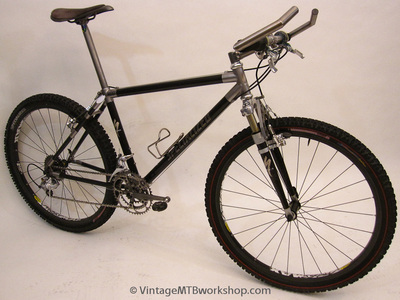 At one time this bike ran a beryllium spindle. Wheelset: Pre-production Mavic CrossMax with ceramic rims. 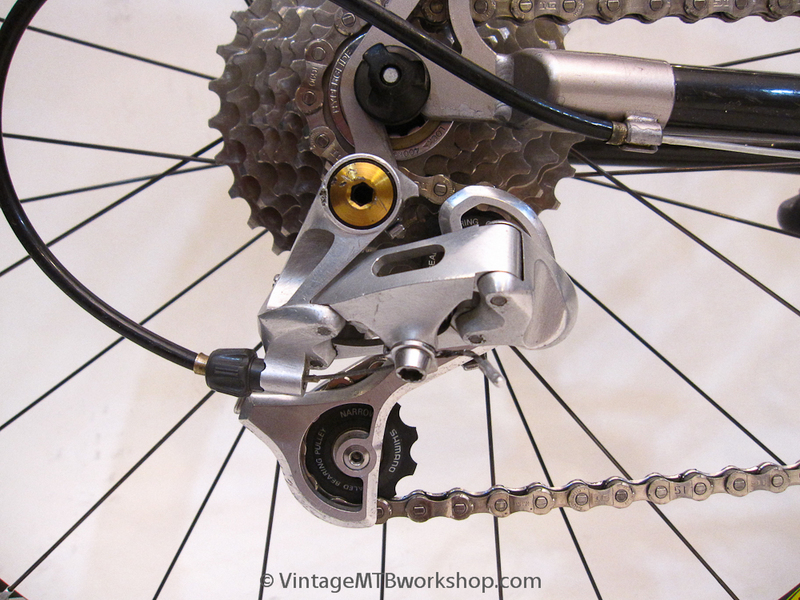 These were a personal gift from Mavic to the owner and were picked up following the 1996 Tour de France while the owner was in Europe. These early model CrossMax wheels would later make their debut at the 1996 Olympics. 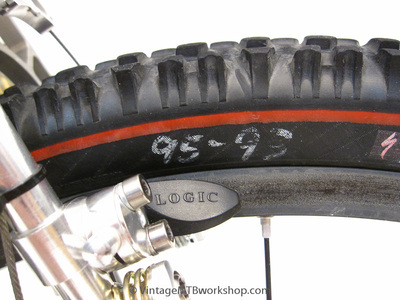 Tires: Prototype S-Works tires with white testing numbers written on the sidewalls. These tires were also an experiment in alternative printing methods for the graphics, where were traditionally done with molding or a label panel.